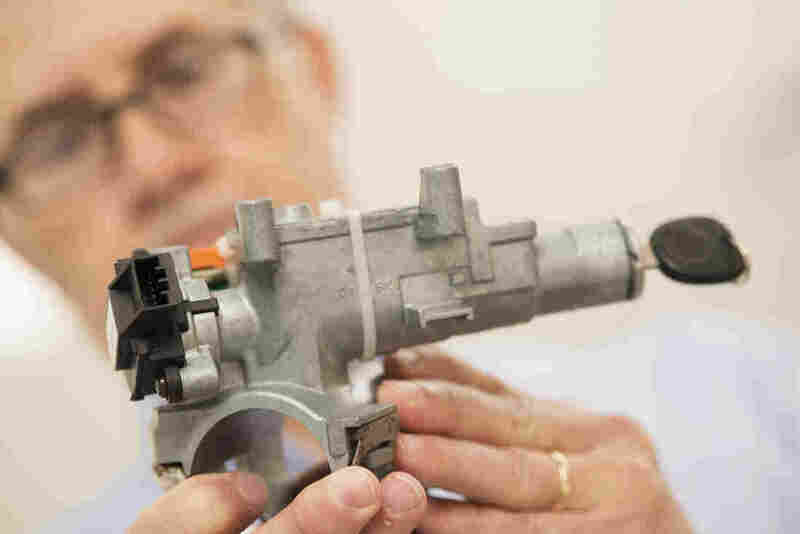 Timeline: A History Of GM's Ignition Switch Defect More than 10 years after the defect was detected, General Motors issued recalls for several models suspected of having a faulty switch. The problem, linked to 13 deaths, has raised several questions. Consulting materials engineer Mark Hood shows the ignition assembly that has a faulty ignition switch (black piece at left), in the mechanical testing laboratory at McSwain Engineering Inc. in Pensacola, Fla. The firm helped to conduct the engineering investigations and failure analysis that resulted in the GM recall. In February, General Motors issued sweeping recalls for several models suspected of having a faulty switch that automatically turns the car's engine off and prevents air bags from deploying — while the car is in motion. More than 2.6 million cars have been recalled so far. At the core of the problem is a part in the vehicle's ignition switch that is 1.6 millimeters less "springy" than it should be. Because this part produces weaker tension, ignition keys in the cars may turn off the engine if shaken just the right way. NPR looked into the timeline of events that led to the recall. It's long and winding, and it presents many questions about how GM handled the situation: How long did the company know of the problem? Why did the company not inform federal safety officials of the problem sooner? Why weren't recalls done sooner? And did GM continue to manufacture models knowing of the defect? 2001: GM detects the defect during pre-production testing of the Saturn Ion. 2003: A service technician closes an inquiry into a stalling Saturn Ion after changing the key ring and noticing the problem was fixed. 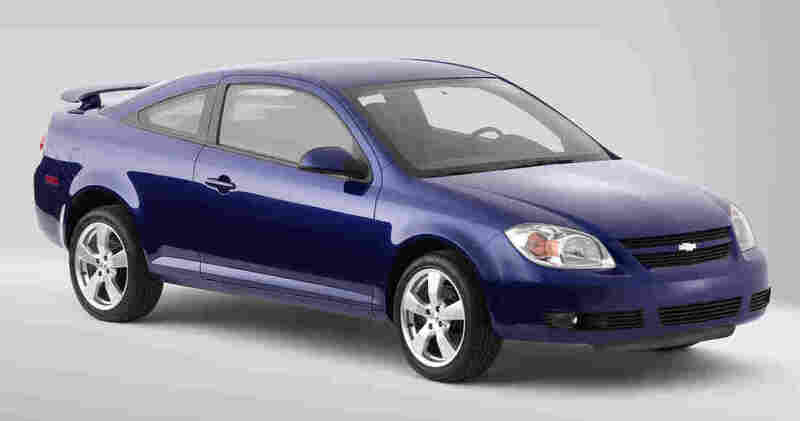 2004: GM recognizes the defect again as the Chevrolet Cobalt replaces the Cavalier. March 2005: GM rejects a proposal to fix the problem because it would be too costly and take too long. May 2005: A GM engineer advises the company to redesign its key head, but the proposal is ultimately rejected. May 24, 2005: GM posts a $1.1 billion first-quarter loss, blaming it on union overhead and high gas prices harming SUV sales. December 2005: GM sends dealers a bulletin stating the defect can occur when "the driver is short and has a large and/or heavy key chain ... the customer should be advised of this potential and should ... [remove] unessential items from their key chain." July 29, 2005: Maryland resident Amber Marie Rose, 16, dies when her 2005 Chevrolet Cobalt crashes into a tree after the ignition switch shuts down the car's electrical system and the air bags fail to deploy. December 2005: GM issues a service bulletin announcing the problem, but does not issue a recall. July 26, 2006: GM loses $3.2 billion in the second quarter, absorbing costs of early retirement buyout packages to 30,000 blue collar workers. March 2007: Safety regulators inform GM of the issues involved in Amber Rose's death; neither GM nor the safety regulators open a formal investigation. April 2007: An investigation links the fatal crash of a 2005 Chevrolet Cobalt in Wisconsin to the ignition defect, but regulators do not conduct an investigation. September 2007: A NHTSA official emails the agency's Office of Defects Investigation recommending a probe looking into the failure of air bags to deploy in crashes involving Chevrolet Cobalts and Saturn Ions, prompted by 29 complaints, four fatal crashes and 14 field reports. Nov. 17, 2007: The Office of Defects Investigation at NHTSA concludes that there is no correlation between the crashes and the failure of air bags to deploy, ending the proposed probe. Dec. 12, 2008: The U.S. Senate votes to oppose a government bailout for GM, despite support from outgoing President George W. Bush and President-elect Barack Obama and GM's announcement that it's nearly out of cash and may not survive beyond 2009. Dec. 18, 2008: President Bush announces bankruptcy is an option, if it's "orderly" and involves unions and other stakeholders. Dec. 19, 2008: Bush approves a bailout plan, giving GM and Chrysler $13.4 billion in initial financing from the Troubled Asset Relief Program. April 22, 2009: GM says it will not be able to make a June 1, 2009, debt payment. 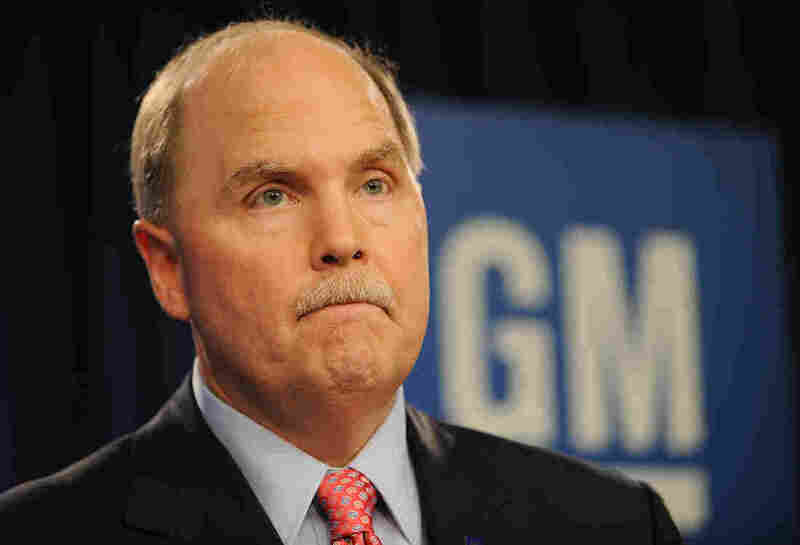 April 24, 2009: GM says that it will scrap the Pontiac brand to invest more in Buick, Cadillac, Chevrolet and GMC. Fritz Henderson, General Motors president and CEO, during a June 1, 2009, press conference to announce that GM will seek bankruptcy protection. June 1, 2009: GM files for Chapter 11 bankruptcy. July 10, 2009: The U.S. Treasury purchases GM assets, giving the government primary ownership of the company. February 2010: NHTSA again recommends a probe looking into problems with air bags in Cobalts; ODI again decides that there is no correlation and drops the matter. Oct. 26, 2010: Consumer Reports says GM is considered "reliable" based on scores from road tests and performance on crash tests. 2012: GM identifies four crashes and four corresponding fatalities (all involving 2004 Saturn Ions) along with six other injuries from four other crashes attributable to the defect. Sept. 4, 2012: GM reports August 2012 sales were up 10 percent from the previous year, with Chevrolet passenger car sales up 25 percent. June 2013: A deposition by a Cobalt program engineer says the company made a "business decision not to fix this problem," raising questions of whether GM consciously decided to launch the Cobalt despite knowing of a defect. Dec. 9, 2013: Treasury Secretary Jacob Lew announces the government had sold the last of what was previously a 60 percent stake in GM, ending the bailout. The bailout had cost taxpayers $10 billion on a $49.5 billion investment. End of 2013: GM determines that the faulty ignition switch is to blame for at least 31 crashes and 13 deaths. 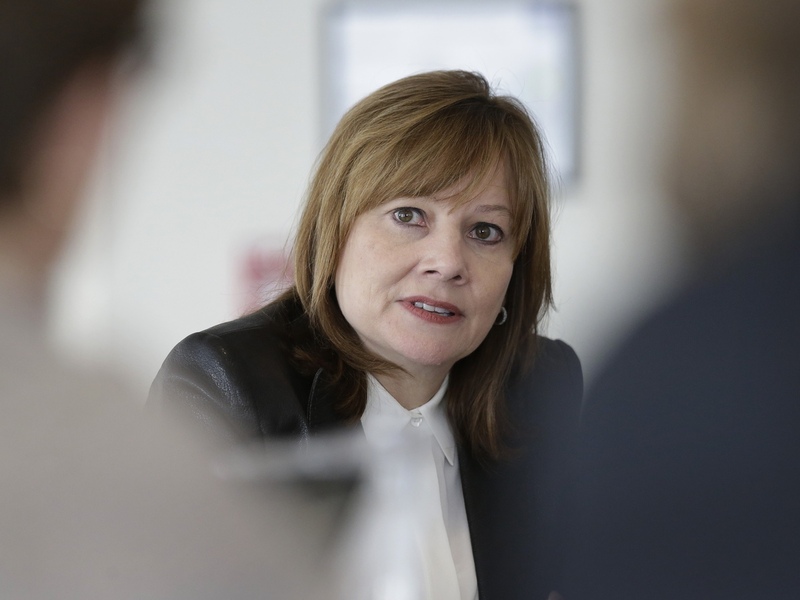 Mary Barra, who became the CEO of General Motors in January 2014, is facing questions over how the company handled the ignition switch problem. Jan. 15, 2014: Mary Barra becomes CEO of GM and the first woman to run a major automaker. Jan. 31, 2014: Barra learns of the ignition switch defect, according to GM. Feb. 7, 2014: GM notifies NHTSA "that it determined that a defect, which relates to motor vehicle safety, exists in 619,122 cars." Feb. 13, 2014: GM officially recalls 2005-2007 Chevrolet Cobalts and 2007 Pontiac G5s. Feb. 25, 2014: GM adds 748,024 more vehicles to the recall. March 10, 2014: GM hires two law firms to look into the recall, with Anton "Tony" Valukas, who investigated Lehman Brothers after the firm's 2008 collapse, leading the internal probe. March 17, 2014: GM recalls 1.55 million vans, sedans and sport utility vehicles. March 30, 2014: House Energy and Commerce Committee Memorandum Previewing Its Hearing On The GM Recall Delay. March 17, 2014: Barra states in a video apology that "something went very wrong" in GM's mishandling of the crisis. She says the company expected about $300 million in expenses in the current quarter to cover the cost of repairing 3 million vehicles. March 18, 2014: GM appoints a new safety chief. March 19, 2014: Attorney General Eric Holder announces that Toyota is being fined a record $1.2 billion, a criminal penalty, for not providing adequate information in 2009 to customers who complained about safety issues involving sudden acceleration of vehicles. March 20, 2014: The House Energy and Commerce Committee's Subcommittee on Oversight and Investigations schedules a hearing for April 1, titled "The GM Ignition Switch Recall: Why Did It Take So Long?" March 28, 2014: GM recalls an additional 824,000 vehicles (including all model years of the Chevrolet Cobalt and HHR, the Pontiac G5 and Solstice, and the Saturn Ion and Sky), stating ignition switches could be faulty; the new total number of recalled vehicles in the U.S. is 2,191,146. April 1, 2014: GM hires Kenneth Feinberg, an attorney specializing in corporate payouts, as a consultant "to explore and evaluate options" in the automaker's response to families of the victims involved in the recall. April 1-2, 2014: Barra and NHTSA Acting Administrator David Friedman testify at House and Senate hearings on the handling of the recall. Barra apologizes to family members whose loved ones have died from the defect. April 3, 2014: Deadline for GM to respond to 107 questions from NHTSA. April 10, 2014: GM starts a Speak Up for Safety campaign, aimed at encouraging employees to say something when they see a potential safety issue for customers. April 10, 2014: Barra confirms that two GM engineers have been put on paid leave as part of the ignition switch investigation. April 10, 2014: GM adds ignition lock cylinders to its safety recall of 2.2 million older model cars in the U.S.
May 15, 2014: GM adds five more recalls of about 2.7 million vehicles in the U.S. They include malfunctioning tail lamps, head lamps and brakes. May 16, 2014: The government announces GM will pay a record $35 million civil penalty after NHTSA determined the automaker delayed reporting the ignition switch defect. June 5, 2014: An internal inquiry by Anton Valukas, a former U.S. attorney, into the ignition switch recall finds an 11-year "history of failures" and "a pattern of incompetence and neglect," Barra says. June 16, 2004: GM announced the recall of 3.2 million more cars, including Chevrolet Impalas and the Cadillac DTS, for faulty ignition switches.